Steven (Chicagoland, United States) on 9 June 2010 in Documentary & Street and Portfolio. "I see one-third of a nation ill-housed, ill-clad, ill-nourished," was a statement made by President Franklin Delano Roosevelt during his second inaugural presidential address and is a statement featured prominently on one of the red granite walls of the Roosevelt memorial. 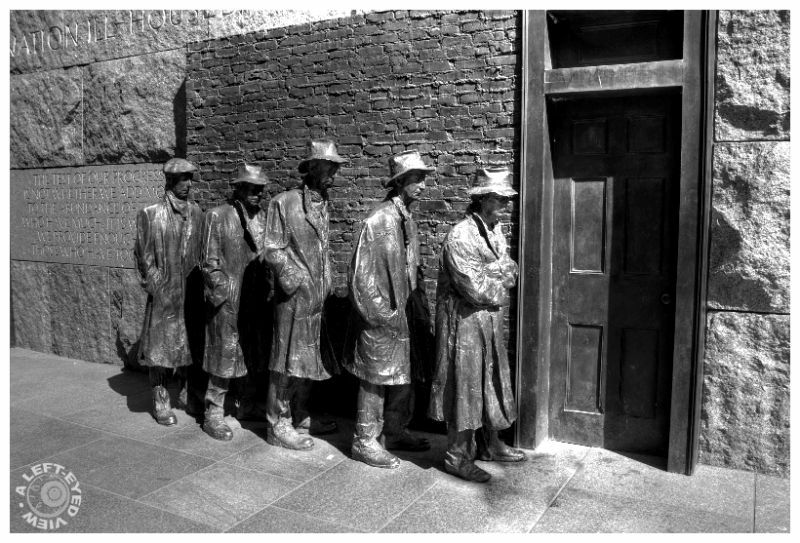 Below that statement stands this sculpture by George Segal titled, "Breadline." Behind the "breadline" and inscribed on the wall is the continuation of the above-referenced inaugural address where Roosevelt went on to say, "The test of our progress is not whether we add more to the abundance of those who have much; it is whether we provide enough for those who have too little." A touching monument; I hope it's not a prediction of the future. Very impressive statue . Reminds me of my visit to Russia ! Superb capture and very nice b/W. Have a lovely afternoon Steven. These figures thru your series are used with such amazing conviction . . they have such presence ! I know all comparisons are "relative" but haven't we come a long way since then? Well, in the developed western economies. I know that it's only a small line, symbolic, but you have portrayed it in a way to help us think and remember. @Curly: The one thing that never came to mind until after my return was to get a self-portrait by standing in line behind them. Fantastic catch, if people today could only imagine such hunger and the patience required to stand in line for hour. An impressive sculpture and depressing to think what it means. Your capture is beautiful. Beautiful shot! Tells the story well. Very impressive! That is sad because the lines continue to this day. Another well composed image. I suppose its not too hard given the subject matter but still, angle is everything.